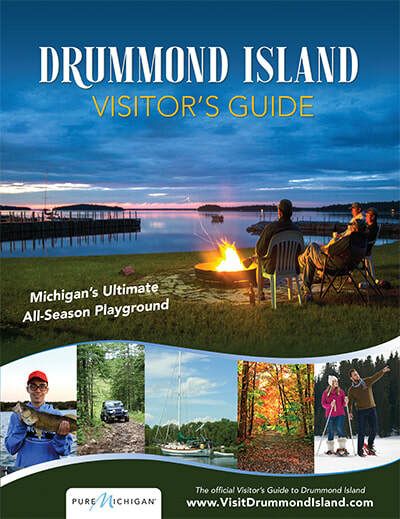 The second largest island in the Great Lakes of Michigan, Drummond is a relatively easy place to visit for your own natural history adventure. The local attitude toward visitors, “Come often, play nicely,” has paid off in the protection of a wide range of unique public places for you to explore. This site describes some of the land forms, rare plants and rare animals you might enjoy. Drummond Island consists of 87,000 acres, about 150 miles of shoreline and twenty-four different biodiversity types. In addition to paved roads, 68% of the land is state-owned, with 117 miles of hikeable off-road trails. 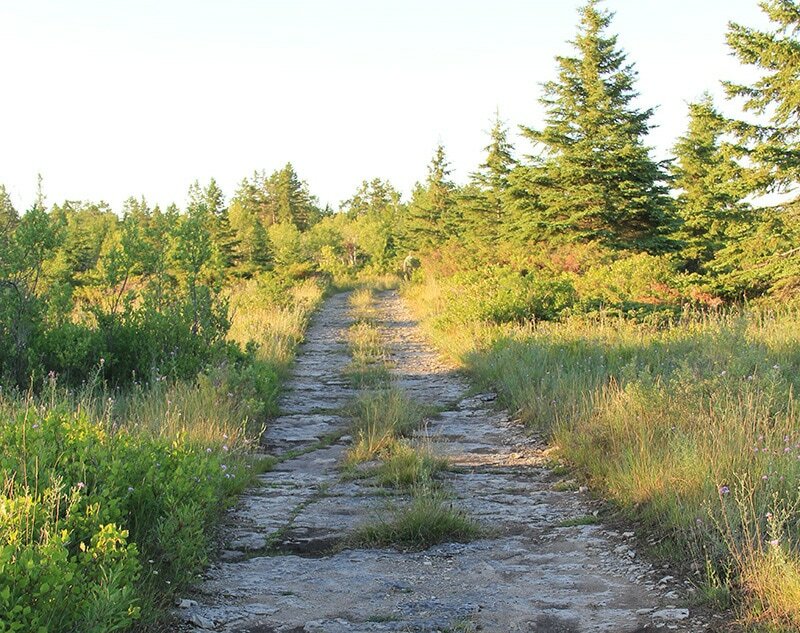 You may also enjoy the Heritage Hiking Trail from the rustic campsites of Drummond Island Township Park, the Little Traverse Nature Conservancy, (Williams Nature Preserve Trail) trails and the public hiking trails at The Rock, one of our two golf courses. In addition, discovery may wait around every corner as you boat along every bit of shoreline and across our inland waters (some isolated interior wetlands are surrounded by private land). Many of our Natural Communities are easy to find, easy to get to, and easy to walk through. Drummond Island puddingstones are a mixture of white quartzite and jasper in colors ranging from deep red to almost blue. Formed in the sands of time before being ripped out of their beds and dropped on the Island by the glaciers, these rocks are classified as sedimentary conglomerates. They can be found nearly everywhere on the Island and range in size from a pebble to the size of a small automobile. Maxton Plains Alvar: Drummond Island has one of the largest, best preserved Alvar plant communities in the world. Alvar plant communities grow in soil-filled cracks and on an easily disturbed layer of topsoil. 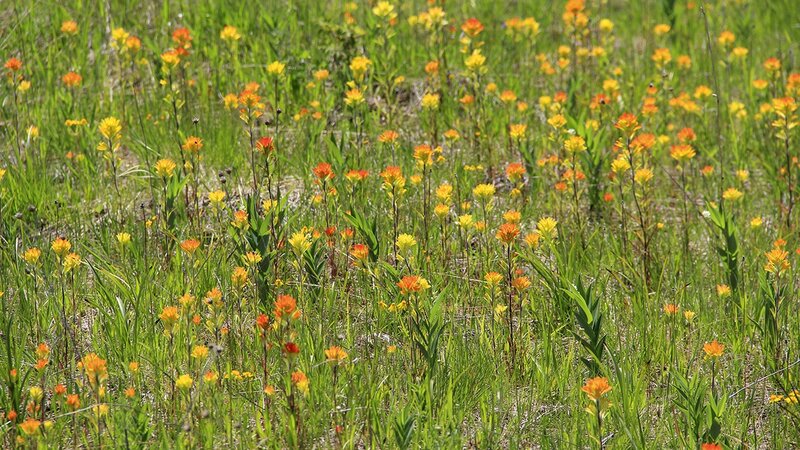 Three of the most dramatic of the blooming plant species are the prairie smoke of spring, the more isolated red of summer’s Indian paintbrush and the early autumn display of prairie dropseed. Indicator Alvar animals are land snails so small that thirty or more of them fit on a dime. (See Rare Animals) Watch for the Tawny Checkerspot butterfly, Phycoides batesii, as it feeds on the asters of Alvar and wet meadows. If you allow your feet to travel all the way to Drummond’s northwest coast, you may discover the lovely summer blue of the fringed gentian, Geninana procera, growing on the cobble beach. Drummond Island was farmed by early Europeans: first to feed their families, then to feed the lumberjacks. (See the paragraph about Harbor Island for evidence of Native American farming practices.) Old Field Meadows may appear to be grasslands, but 50% or more of the plants are wildflowers (forbes) with relatively broad leaves. Old Field succession provides a mix of plants and forest edges that attract birds and butterflies. In the shrub stage of succession, old field meadow coverage is less than 10% shrubs. Although they are scattered all over the Island, the roads to Scammon Cove pass some Old Field Meadows with rocks dressed in the bright orange monument lichen, Caloplaca saxicola. Boreal forests have become relatively uncommon in the Great Lakes. The plants and animals of this natural community thrive in low winter temperatures, a cool growing season and low-fertility soils. A boreal forest is identified by its dense growth of mostly conical evergreens. The thin soil offers opportunity for a scattered understory to form in wind-generated openings. Ground-covering boreal plants are generally long-lived, have a slow growth rate and produce a spare, yet exquisite show of flowers. A unique suite of animals and plants also identifies the boreal forest, including some that are rare in Michigan. Although there is boreal forest on the Big Island, it may be easier to identify it on Harbor Island. Although the larger of the animals (moose, wolves) are not resident on Drummond, the lone wolf or lynx is not unheard of. The calypso and ram’s head orchids are found here. ​The northern mesic (moist earth) forests on Drummond Island are dominated by sugar maples. However, our high water table and relatively shallow soil depth above bedrock increases the types of hardwood species and evergreens. These forests also hold a diverse, slowly changing understory plus a rich mix of shrubs and groundcovers. Their mix of flowers and fruits attracts a rich local bird population. This is enhanced with edges created by roads and natural glades throughout. Unique among the mesic groundcovers, some plants grow without chlorophyll; Indian pipes from the blueberry family, coral root orchids and beechdrops await your discovery. The Little Traverse Conservancy is steward for the eighty acres of forested land of the Clyde and Martha Williams Preserve. The roads to Marblehead pass through an area known as The Knobs where some of our most spectacular hardwoods grow. In addition to some beautiful old northern white cedars our Rich Conifer Swamps are noted for their low shrubs. Labrador tea, letherleaf, red and black currents, blueberry, and bilberry may all attract a variety of illusive insects and birds to the feast. Upland and lowland white cedars grow all over the Island. Some of best, easy-to-reach Northern White Cedar Swamps on public land are located at the Pigeon Cove Flooding and the Potagannissing Wildlife Flooding. Although swampland is not easy to navigate, Michigan-rare plants and animals may live among the abundance of mosses, lichens and liverworts that grow here. Cobble beaches form along the especially dynamic face of wind and waves. Both processes can move small to moderate size rocks while they fill or remove the sands and organic particles that fall among them. Winter shoreline ice freezes to the bottom. When loosened during storms, the movement of the ice may swiftly erode and modify the shore. Storm beaches are formed by cobble-sized rocks piling on top of each other several feet deep. Cyclic fluctuations of water levels significantly influence vegetation patterns on a limestone cobblestone beach. Plants, including shrubs and trees, become well established during low-water periods but die back or disappear altogether during high-water periods. Still, our cobble beaches hold a surprising diversity of small plants. ​www.fws.gov/refuge/harbor_island/ At the waters edge, our beaches begin as flat cobbles. A little farther up a variable mix of wildflowers begins to grow. The reach of the prevailing wave rush determines where and if shrub-sized poplar, tamarack, paper birch and northern white-cedar trees will drive their roots between and into the cobbles. Recurring high water levels do not often allow these trees to reach maturity, but behind this buffer a dense thicket of paper birch, quaking aspen, northern white cedar and white spruce grows in a mix of real shrubs. Even with, or perhaps driven by, constantly changing conditions, a cobble beach is a rich habitat for animals. Fox, mink and raccoons are among the hunters. Terrestrial insects cling to rock surfaces and sediments that are also rich in aquatic invertebrates. Spring and Fall migrating warblers feast on the midges that dance and settle among the northern white cedars. Cobble Beach is the primary form of beach all around Drummond Island. Our Cobble Beaches often progress out toward and into the water as Limestone Bedrock Lakeshore. 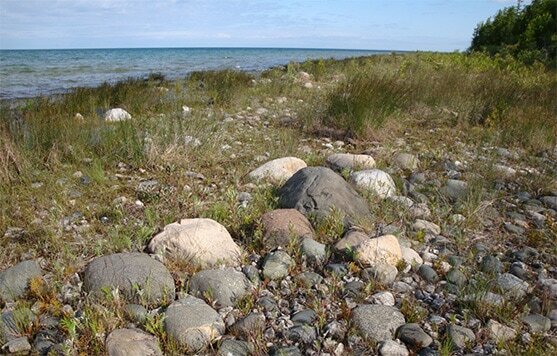 A total of 147 vascular plants have been found on Great Lakes limestone beaches. The MNFI abstract says, “On any given stretch of bedrock lakeshore one would, on average, encounter 24 vascular plants.” Michgan’s indicator species are Primula mitassinica, a pretty white primrose, and the Carex richardsonii sedge. Elaine Haug’s capture of the upright petals of the Mitiassini Primsore can be enjoyed. The Big Island also hosts the plant and animal communities found in association with inundated shrub swamps, sedge meadows and the two public sand beaches. Out in Potagannissing Bay, Harbor Island has two harbors reaching deep inland, and includes just over 700 acres of public land plus 9 miles of shoreline for you to explore. These include three state-significant natural communities: Harbor’s Great Lakes Marsh rims the northeast inner harbor, holds the rank for highest quality. The age of the red-oak dominated Mesic Northern Forest along the east shore indicates that it probably was founded with pre-settlement Native American land-use practices. Two boreal forests on the Island form part of the southern limit of this Arctic community. 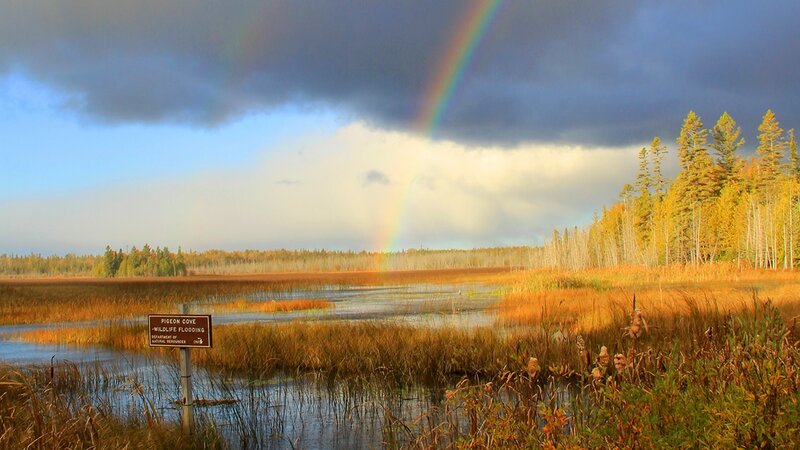 Managed as part of the Seney National Wildlife Refuge, all of Harbor Island, with its unique plant and animal communities, is within easy hiking distance of your boat. No overnight camping and no fires are allowed on Harbor Island. To learn more visit the Harbor Island National Preserve page.